N Scale MICRO TRAINS 3 Bay ACF Centerflow Covered Hopper w/round hatches "Union Pacific"
N Scale MICRO TRAINS 3 Bay ACF Centerflow Covered Hopper w/round hatches and "Atchison, Topeka & Santa Fe" markings. 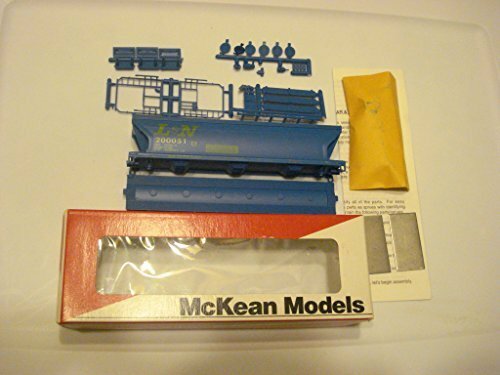 Highest quality N scale trains made, model includes the famous "Magne-Matic" couplers that this brand is well known for! The three-compartment ACF(c) 3560 Center Flow Covered Hopper was designed for the transport of high-density dry bulk ladings of 50 - 60 pounds per cubic foot. Examples of these commodities include salt, fertilizer, starch, bauxite, and clay. The 100-ton car was designed to fit into the smallest modern plate diagram dimensions, Plate B. Features: V-frame ends Side sheet weld seams Roping staples Five roof hatches Body mounted brake gear True scale dimensions with accurate details Weighted, detailed underframes Equipped with AccuMate(c) knuckle couplers N Scale IMAGE SHOWN IS A REPRESENTATION. THE ACTUAL ROAD NUMBER IS IN THE PRODUCT DESCRIPTION. WARNING: CHOKING HAZARD - SMALL PARTS! NOT INTENDED FOR CHILDREN UNDER 3. Intermountain ACF 4650 Cubic Foot 3-Bay Covered Hoppers are super-detailed models featuring sharp printing and etched metal roofwalks. Cars are available in various road numbers. When purchasing multiple items we will do our best to send a variety of road numbers. Please contact us prior to purchase if you are looking for a specific road number and we will be happy to check availability. HO Scale Model Train car.